NBA journeyman Jason Collins has announced he's gay, talking about his decision to go public in a cover story for Sports Illustrated. He is considered the first male from a major North American team sport to announce he is gay. NBA journeyman Jason Collins has announced he's gay, talking about his decision to go public in a cover story for Sports Illustrated. Collins, an NBA veteran of 713 games, playing last season with Boston and Washington. The 34-year-old centre previously played for Atlanta, Minnesota, Memphis and New Jersey. The seven-footer was selected 18th overall in the first round of the 2001 draft out of Stanford. 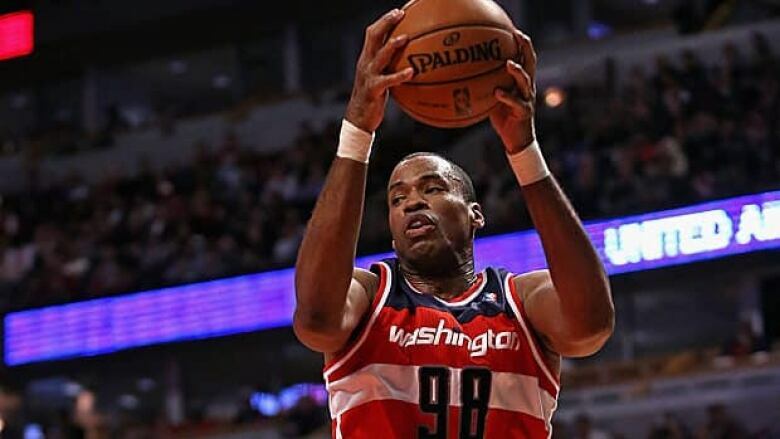 NBA veteran Jason Collins received support from Canada Monday as he became the first active male player in the four major North American professional sports to come out as gay. "Happy for my former teammate Jason Colllins. A true American. 'home of the free because of the brave,'" tweeted Toronto Raptors forward Rudy Gay. "NBA player Jason Collins comes out as openly gay, Good for him Athletes are more open and forward thinking than we get credit for his choice," offered veteran CFL receiver Geroy Simon. Toronto Maple Leafs winger Joffrey Lupul agreed it was a big day for sports. "Obviously we knew this day was going to happen when an athlete came out of the closet," he said. "It takes a lot of courage by him and, hopefully, it leads to more people being able to be comfortable with that." The NHL has taken the lead in advocating for more openness. Patrick Burke, a Philadelphia Flyers scout and the son of former Leafs general manager Brian Burke, is one of the founders of the You Can Play movement dedicated to fighting homophobia in sports. "I think the fruits of his work are just starting to come forward and I would expect to hear more and more of that as time moves along," said Leafs general manager Dave Nonis of Burke. Collins finished the NBA season with the Washington Wizards and is now a free agent but says he wants to keep playing. Leafs coach Randy Carlyle said he both was and wasn't surprised. For one thing, he said, if estimates are that perhaps 10 per cent of the general population is gay, he sees no reason to suspect that wouldn't hold true in the sports world. Collins writes: "If I had my way, someone else would have already done this. Nobody has, which is why I'm raising my hand." Collins played in a Final Four for Stanford and reached two NBA Finals. His twin brother, Jarron, was also a longtime NBA centre. Jason says he came out to his brother last summer. Collins could be considered the first male from a major North American team sport to announce he is gay, although his playing status for next season is open to question. He averaged just under 10 minutes a game in 38 regular season appearances in 2012-13. After being a first-round draft pick in 2001, Collins has averaged 3.6 points and 3.8 rebounds for the Nets, Grizzlies, Timberwolves, Hawks, Celtics and Wizards. Commissioner David Stern also was quick to pay tribute to Collins. "Jason has been a widely respected player and teammate throughout his career and we are proud he has assumed the leadership mantle on this very important issue," Stern said in a statement. Washington Wizards president Ernie Grunfeld quickly followed suit. "We are extremely proud of Jason and support his decision to live his life proudly and openly," said Grunfeld in a statement. "He has been a leader on and off the court and an outstanding teammate throughout his NBA career. Those qualities will continue to serve him both as a player and as a positive role model for others of all sexual orientation." Collins' coach with the Celtics, Doc Rivers, drew a comparison between Monday's announcement and Jackie Robinson's role when he joined the Brooklyn Dodgers in 1947, breaking the colour barrier in Major League Baseball. "I am extremely happy and proud of Jason Collins. He's a pro's pro. He is the consummate professional and he is one of my favourite 'team' players I have ever coached," Rivers said. "If you have learned anything from Jackie Robinson, it is that teammates are always the first to accept. It will be society who has to learn tolerance." Former president Bill Clinton also voiced encouragement for Collins, asking fans, NBA colleagues and the media to support and respect him in a statement Monday. Clinton said he has known Collins since the player attended Stanford University with his daughter Chelsea. Sports equipment maker Nike released a statement Monday saying: "We admire Jason's courage and are proud that he is a Nike athlete. Nike believes in a level playing field where an athlete's sexual orientation is not a consideration." John Amaechi (basketball), Billy Bean (baseball), and David Kopay (NFL) announced their sexuality after retiring. Overseas, professional Welsh rugby player Gareth Thomas announced he was gay while still playing in 2009. The announcement came during what could be a slowly changing climate for professional athletes who are gay. The NHL and NHLPA have teamed up to combat homophobia through the You Can Play initiative, which was spearheaded by the family of longtime league executive Brian Burke. Another landmark announcement came in October, when active Puerto Rican boxer Orlando Cruz went public with his sexuality. More recently, 25-year-old soccer player Robbie Rogers abruptly retired and announced he was gay. He followed in the footsteps of soccer player David Testo, who came out upon retiring from the Montreal Impact. Female athletes have encountered less resistance historically in announcing their sexuality, although it's debatable whether it has negatively impacted their ability to receive endorsements. Tennis star Martina Navratilova and WNBA most valuable player Sheryl Swoopes are among the most notable gay athletes of all time, while No. 1 WNBA draft pick Brittney Griner last week announced she was gay — news that received relatively little press attention.